So we definitely are more familiar with King Cakes and paczkis, but the reach of the Mardi Gras fried doughnut also extends to Germany with Fasnacht. Fasnacht is a type of fried doughnut used to celebrate the holiday of Fasnacht, from where it gets its name. Fasnacht/Fastnacht (as it is called in Germany, Austria and Switzerland) means “Fast Night” and is the day before Ash Wednesday, where the last decadent treats (like the sugar and oil in doughnuts) are supposed to be eaten before the austerity of Lent kicks in. Fasnacht doughnuts may be square-shaped or more round like paczkis. I have never seen Fasnacht for sale, but outside of German-speaking Europe you can find them in small pockets, especially in places with Amish populations! Here are some recipes from All Recipes, Eve of Reduction, and PA Dutch Country (recipe circa 1936). There are Austrian cafes dotting Lisbon, including one of our Lisbon favorites, Pois, café. We had heard there was another Austrian coffeehouse in town, Kaffeehaus (Rua Anchieta 3, 1200-023 Lisboa, Portugal) and after a late night exploring Chiado we decided to stop in. We were not sure what to make of Kaffeehaus, it is part restaurant part bar and part cafe, and we saw people enjoying it for all of these purposes when we popped in at about 9 PM. We kind of like the multipurpose bar/cafe/hangout aspect, something more uncommon in the USA, I think. It is even dog friendly! The beverage menu was quite prolific, featuring Austrian coffee drinks and custom lemonades as well as a large beer and wine list. We appreciate the large and unique selection of nonalcoholic beverages including tea, special Austrian carbonated juices and fresh lemonade. M ordered a unique hot chocolate drink from Austria which came with a bar of chocolate and a cup of hot milk which you have to mix in using a little frother. L ordered a fizzy ginger lemonade (one among many homemade lemonade varieties). There was also a case with about a half dozen attractive looking cakes included strudels, fruit tarts and the popular-in-Lisbon meringues. Though we were almost tempted away by Apfelstrüdel, we went with the classic chocolate Linzertorte and the Austrian cheesecake, Käsekuche. The Linzertorte was good and chocolatey but the kasekuche was a real standout, with a totally unique texture that was more like bread or cake than a creamy New York style cheesecake. If you are feeling munchies, there is also full lunch and dinner menu with Austrian favorites like Spätzle, and brunch on the weekends. Kaffeehaus is a great place to relax at any time of the day, no matter what mood you are in, and you can even bring your dog. Pois Café features a standard menu at as well as a rotating slate of specials. The main offerings are various sandwiches, tostas and wraps with international flair ranging from 6 to 10 euros. There are other light dishes, (quiches seem to be a big favorite). Pois Café is mainly a breakfast and lunch place and they also offer a nice brunch with pastries, yogurt, juice, muesli for less than 10 euros. For our lunch we had a Mozart sandwich (prosciutto, balsamic vinegar and arugula) as well as an Ilha sandwich (seen below – with a duo of Azorean cheeses, pear and paprika); both were around 7 Euros. The sandwiches were both delicious and fresh, and we enjoyed the unique flavor combos. After finishing our meal, our attention quickly turned to the shiny glass case at the back of the restaurant, packed with Austrian cakes and sweets. At 4 euros per slice the price seemed high, but then again there is very little that can come between us and a pastry. The cakes looked delicious and we couldn’t resist after our chocolate cake cravings, especially given the general Portuguese lack of chocolate desserts. With a little influence from our server’s recommendations and a little more from our discerning eyes, we ordered the Tarte Russe (seen below), a cake with a chocolate base layer topped with a light lemon-flavored cream. For contrast, we also got a slice of passionfruit cheesecake. While very tasty, the cheesecake was a little light for those of you looking for a New York style cheesecake. But the Tarte Russe was a delightful bit of chocolate heaven. Pois Café definitely invites you to linger and it seems to have gained a strong following from the international community, tourists and locals alike. The restaurant is an absolute gem, and is definitely one of our favorite places for lunch in Lisbon. It’s December 1st! And that means a new year of Advent calendars. Advent calendars (Adventskalender) date back to Lutherans in 19th Century Germany, where they were (and are) used to count down the days until Christmas. In our case, December 1st means chocolate advent calendars. There are some enticing looking varieties out there. But I’m going to opt for something a bit more low-key. Cost Plus World Market sells some good varieties from Deutschland for less than 5 bucks. December 1st is also the traditional start date for Weihnachtsmärkte, Austrian and German outdoor holiday markets. According to Wikipedia, Vienna’s market is the oldest and dates back to 1294. 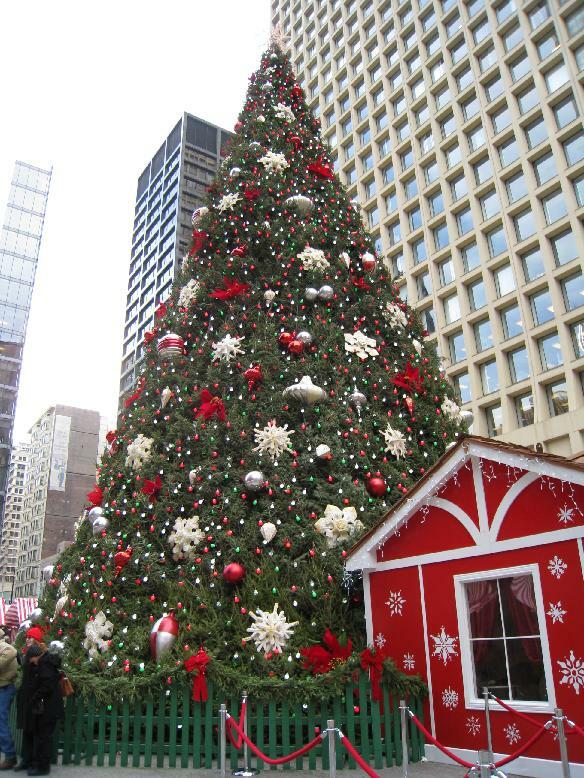 This past weekend we had the fortune to go to Chicago’s very own Weihnachtsmärkte, the Christkindlmarket. 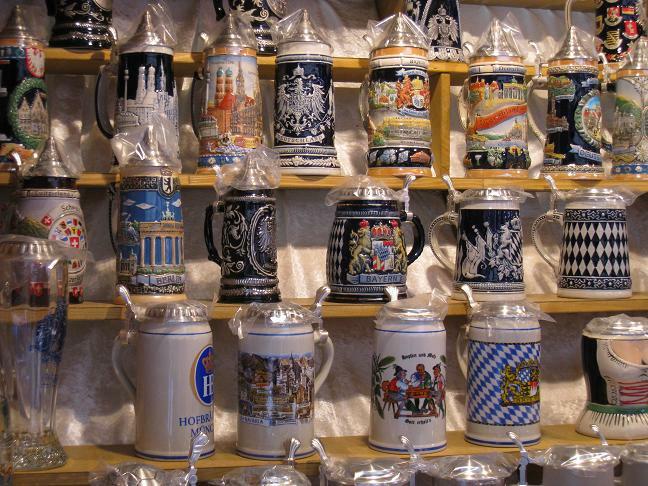 The long-running market takes place at Daley Plaza in the heart of Chicago’s Loop and contains a giant Christmas Tree and tons of booths chock full of German handicrafts and food (like the Bavarian steins above). The Market runs through the 24th so there is still plenty of time to get festive. A stone’s throw from Wrigley Field. Julius Meinl is a little taste of Vienna right in Chicago. Julius Meinl is an Austrian company known for their coffee blends (and unique logo), and this cozy cafe is their only American outpost. You can either take out coffee and tea drinks to go, or dine in on a menu of American and European fare. The drink menu is stunningly comprehensive and extensive, featuring Meinl’s artisan coffee blends as well as specialty drinks like Black Forest Mocha ($4.45) and Vienna Eiskaffe ($2.95), a blend of espresso and vanilla ice cream. If you are eating in, there is table service at an ample seating area. Meinl has an extensive breakfast menu as well as soups and sandwiches. The European portion of the menu includes Spätzle, Crepes and Austrian goulash. A favorite off the American portion of the menu is the Chicken Salad Sandwich with grapes, apricots, walnuts and Tarragon dressing. The sandwich comes on hearty walnut wheat bread, with a small micro-green salad ($7.95). However, perhaps the most enticing part of Julius Meinl are the desserts. You can scope out the goods, baked in-house, in the glass case at the counter, ranging from about $4-6. If you like chocolate, you won’t be disappointed. The Viennese Torte is an excellent mix of bittersweet chocolate and apricot jam, as is the Mohr Im Hemd – a chocolate cake with a molten chocolate center. The service is a bit erratic, unfortunately, but the surroundings are comfortable. If you’re ever around Wrigley Field, looking for a relaxing lunch or a cup of joe, Julius Meinl is a great alternative to the ho-hum Starbucks or Corner Bakery. Come for the coffee, stay for the dessert.